Today is one of the most important days in the Christian tradition. Those who celebrate probably went to church this morning, visited with relatives, and may be looking forward to a big meal with family and friends. If you have kids, there may also have been baskets of candy from the Easter bunny or hunts for decorated Easter eggs. In the Middle Ages, Easter traditions were similar. 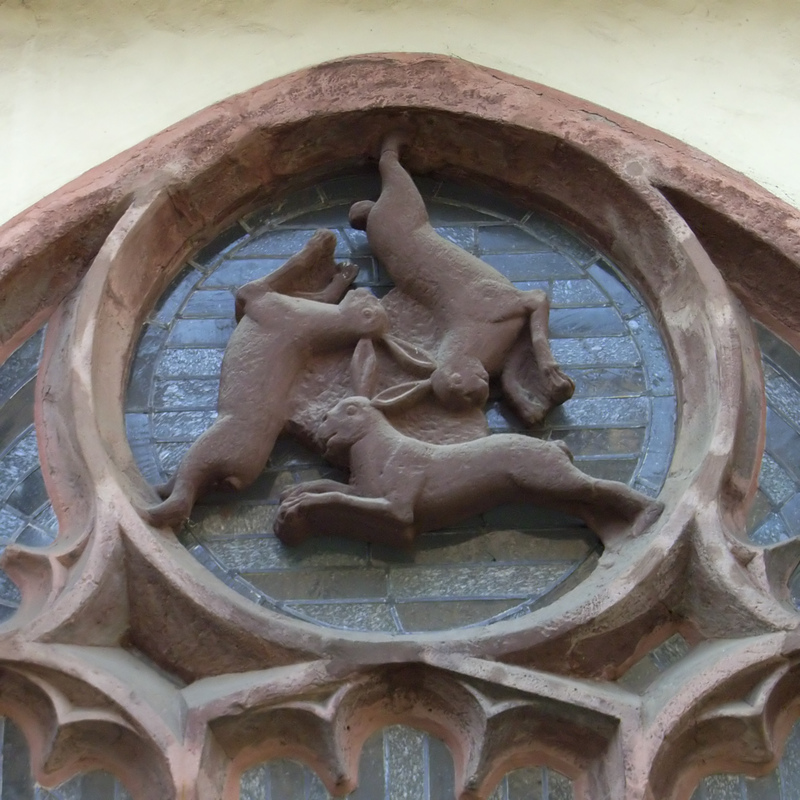 You can read more about them at the blog of A Medievalist Errant, but here are some highlights. The three days before Easter — Maundy Thursday, Good Friday, and Holy Saturday — were called the Triduum, and were marked by solemn services called Tenebrae that were held in almost complete darkness. The parishioners were also denied the Eucharist during these days. Of course Easter is closely linked to the Jewish holiday Passover, since the Last Supper was a Passover seder. This year the two holidays are in close proximity, but that isn’t always the case due to a decision by the First Council of Nicaea in 325 to make Easter independent of the Jewish calendar. It took centuries for the Catholic Church to standardize the date of Easter as the first Sunday after the first full moon on or after March 21st. Even today, Eastern Orthodox Christians celebrate the holiday on a different date from Catholic and Protestant traditions. People got new clothes. Usually the nobility bought or had clothes made new for them, then passed their older clothes down to servants, who passed their old clothes on to relatives, and so on. 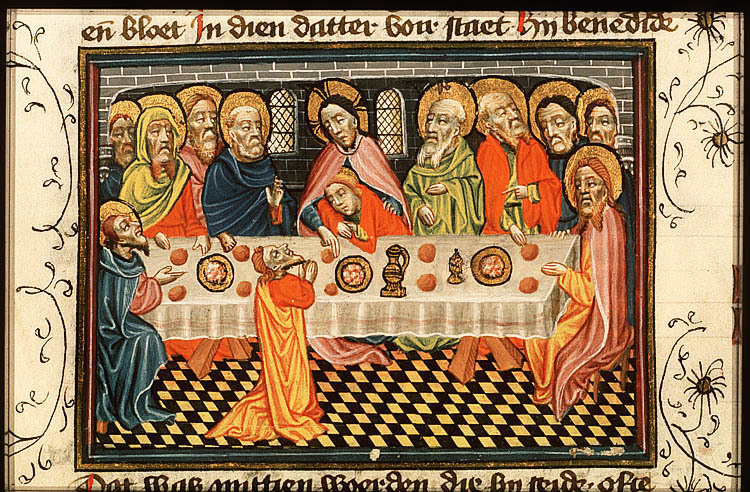 Eggs were featured because, like meat, they were forbidden during Lent. Eggs laid during Lent were boiled to preserve them. The practice of painting eggs goes back a long way; early Christians of Mesopotamia painted them red to symbolize the blood of Christ. The Medievalist Errant notes, “In 1276, Eleanor and Simon de Montfort bought 3700 eggs for their celebration, and in 1290 Edward I’s accounts show that he paid to have 450 eggs decorated with gold leaf.” Eggs were hidden for children to find as an allegory for the disciples finding the risen Christ in the tomb on Easter morning. On the Monday and Tuesday after Easter, young women would capture young men, releasing them on a payment of donation to the church. On Tuesday, the tables were turned and the young men would capture the women. These days were referred to as “Hock” Monday and Tuesday. What about the Easter bunny, you say? Alas, he’s out of period. The first mention of the Easter Bunny appears in Georg Franck von Franckenau’s De ovis paschalibus (About Easter Eggs) in 1682, referring to the German tradition of an Easter Hare who judged children’s behavior at the start of the Easter season, and brought Easter eggs to the good children. “Paderborner Dom Dreihasenfenster” by Zefram – Own work. Licensed under GFDL via Wikimedia Commons.